I would too! That's so interesting how they were all smuggled out of former East Germany. That's a very interesting story and a fascinating piece of history. Here it is. It's Joseph and Maria with the baby. The stand of the statue is marble, the statue itself is bronze and the white/yellowish parts are ivory. It's massive, very, very heavy, I have problems lifting it with one hand. Once a year one of my parents drove to my paternal grandparents (in the former GDR). 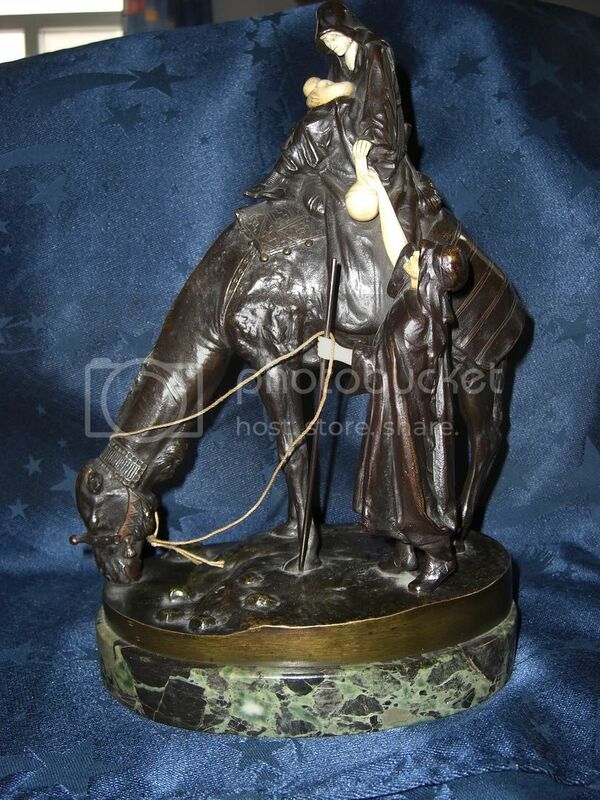 Every time they brought home one or a few new pieces of Meißner or art stuff, like this statue or an oil painting. Of course it was forbidden to bring such things out of the GDR. But they belonged rightfully to my family, so all the things were smuggled through the Iron Curtain. Otherwise, the government would have gotten everything after my grandperent's death. There were no other heirs. My grandparents were poor people, but either a brother or cousin (I'm not sure which) of my grandfather had been an artist himself and an art collector (on a small scale of course). After the man's death my grandparents inherited some of his possessions. Anyway, my father wanted to bring over this statue for the longest time, he loved it very much. But he didn't dare. Not all of the smuggling went unnoticed, sometimes things were found by the border officials. Then the pieces were seized and my parents had to pay a fine. The controls were very strict, you had to declare everything, every single piece you brought out of the country. Even if it was just some kitchen towels. The border officials took a look at the list, then demanded to be shown the things which seemed dubious to them. Furthermore they searched your luggare for undeclared goods. Those searches could be everything from superficial to meticulous and include personal searches. As a rule of thumb, you mostly had to open every suitcase and bag, and the border official rummaged briefly through it, without taking every single piece out. So, one year my mother decided to bring the statue. She didn't tell my father anything. While being in the GDR, she bought a small statue made of salt stone (I translated literally, I didn't find a translation for it; it's made from real salt mainly, plus some other chemicals). Those salt stones are fragile and dissolve in water. She declared in her list "one statue", as a bait, and of course the border official wanted to see it. My mother made a big ado over the (salt) statue, she unwrapped it carefully and asked the official to handle it very, very carefully and told him a fantasy story why this statue was so precious to her. Of course the thingie was almost worthless and she was allowed to keep it. The trick worked and my parents ended up woth two statues . Years later I accidently broke the salt statue. Yes of course it's real Meißen, lol. When I say Meißen, I mean it. Thousands? Are you kidding me? Or are the prices for Meißner down under that much higher? AFAIK, the prizes for single pieces and place covers (plate, cup and saucer as a set) are in the lower hundreds here (Euros). If you want to reach the dimension of thousands, you'd need to have a complete service. Or maybe a very, very rare and old special piece. And I doubt that one of mine belongs in that category. So yes, if I sold everything, it would bring quite some bucks, that's right. But far (very, very far) from being enough to become rich. My-zen would be good. Actually the letter ß is an Es-Zet, somewhere between s and z. Apologies, Chrissi. I didn't mean to imply that I doubted you. It was my fault. I hadn't at first clicked that what you were calling Meißen was what I call Meissen. I'm not a German speaker, so when I see a "ß" I pronounce it "bee" not "zee." No need to apologize Kerry! I didn't take it that way. I assumed you just hadn't clicked. And yes, the ß looks much like a B. From now on, you can pronounce it "zee". The things you learn on BetterMost, hunh? The prices for Meißner vary, depending on how old and how rare the pieces are. Just like with all collectibles I guess. In the end, the Blue Mauritius is just a stamp - or is it? But it may well be that prices for Meißner are higher in those parts of the world which are far away from Germany. Fewer supply, higher prices. Maybe I could really make a (very) small fortune if I shipped all the stuff to Australia and auctioned it there, who knows? Chrissi, your china is beautiful. All of it. Thank you so much for taking the time to photograph it for us. I particularly loved the story behind this statue. The statue is very beautiful. I have a huge fond spot for the Holy Family. But the hardships people faced - just to bring along a possession as simple as a statue- during the years of East and West Germany both appall me and warm my heart. I'm so glad your Mother managed to get it out of there and bring it with her. And now you have it. It's a beautiful statue and a wonderful story! I have had a lovely time reading through this thread. It made me think of all the things that remind me of my parents. I have no recollection of grandparents I was very young when they died. I realise that I am turning into my mother. She has a lovely collection of stunning porcelain, Lladro,crown derby and many more. Yet she keeps the Pendelphin rabbits we got her when we were young in the same display cabinet. I do the same, I have lots of Halcyon Days boxes, Crown Derby and Lladro, all side by side with the, cars, money boxes plates etc, that the kids painted for me when they were younger at places like splatters. I can see now that if I outlast my mum, it will be her rabbit collection I want. I remember each one of them. My father, well I suspect my brother and I will both want his collection of classical records and the turntable to play them on. I'd love to see some pics of your treasured possessions, Fiona. And to read the story behind them too. Like your Mum's rabbits, I find that it's often the things that don't necessarily have a great monetary value that I treasure the most - such as my Mum's plant and her old armchair. There's no way a monetary value can be put on such items 'cause they're priceless. I'd love to see some pictures too Fiona. My Great Grandmother owned three Hummels in her lifetime, and just before she moved into a nursing home she decided to give me her Hummels. She gave me one Hummel each year for the next three Christmases. Just after my sister was born, Mom and Dad took us both down to Cincinnati to meet our Great Grandma. Before we left, Mom and Dad wanted to buy something special for her and they decided on the Hummel up there in the picture. It is called "Going To Grandma's". There used to be a price tag on it, but I guess it fell off. I think Mom paid about $26.00 for it in 1963. 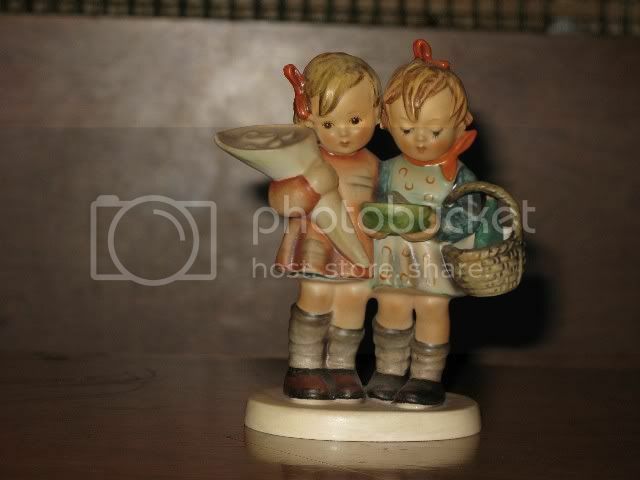 As you can see the figurine has two little girls in it, and I've often marvelled and pondered over the irony of it. So anyway, now it is here with me. It was a gift given by my parents to my Great Grandmother, and then years later it was a gift from my Great Grandmother to me. Well I have had a whale of a time looking up Pendelfin rabbits. They were started by 2 ladies who lived in the shadow of Pendle mountain in Lancashire.A place famed for the Pendle witches. I cannot see some of the very old pieces my mother has, but I did find three. Rosa rabbit,Uncle Soames and the twins. My personal favourite is of a baby rabbit asleep in bed sucking its thumb. My father bought it for her to mark my birth. My mum must have over 50 of the pieces and I was flabbergasted to see that the rare early ones she has most of, fetch up to 300 pounds !!! Sorry I can't post pics of them as they are thousands of miles away in my parents cabinet.I will post pics of the wonderful hand painted ornaments my kids have made for me over the years. Along with the jewellery they used to buy me from fairs, with their own pocket money. All of which I wore so as not to hurt anyones feelings. In reminiscing back over so many years, I was reminded of the greatest loss I encountered when we moved here. We arrived in Sarasota, via NYC on Dec.31st 2005. It was therefore nearly a full year before we had our first Xmas here. I was brimming over with unconcealed excitement as the Americans are so gloriously OTT in their unfettered celebration and decoration at Xmas. I was in my element. For as long as I can remember Xmas has always been my favourite time of year. I loved it when I was growing up, helping my mum make the Xmas cake and pudding, hiding the sixpence in the pudding batter and the glorious smells which infused the whole house. Then there was the baking and eating of the first mince pies, hot from the oven and bursting with fruit and spices. It was a tradition in our house that you made a wish with your first bite. Then the argument as dad tried to make the tree lights work, followed by mum and me, pouring a glass of mulled wine and settling down to decorate the tree.My mother's excitement and love stemmed from the fact that she had been orphaned in WW2 and then spent 5 years in an orphanage. Prior to that though, her father who was the village doctor, usually got to spend a whole day with his wife and daughter.The villagers for the most part,managing to refrain from being ill for that one day.So it was one of the very few times my mum got to spend with both her parents. This excitement she transferred on to me and I was hooked. We would start to giggle as the mulled wine did its work and the end result was a haphazard but glorious riot of decorations on the tree. No designer looks for us. She had some very old and curious decorations which had belonged to her parents and were some of the few things she managed to keep. There was a clown, pierrot, very strange Santa and a tree. There were also some incredible Chinese lantern lights. No matter how many new baubles joined the party, the old ones were never forgotten. When I married and left home, my mother came round as my first Xmas as a wife approached and handed me her parents decorations. Oh this is making me cry. We both went into my tiny kitchen and started on the mince pies and as we were feeling sophisticated opened a glorious bottle of red that she had " borrowed" from my father's cellar. Over the years the Xmas decorations became increasingly more eclectic as the kids added on their school made, snowflakes,Santa's and all manner of baubles. When we moved to a larger house we started to have 2 trees. One in the family room with all the colourful and raffish decorations and one in the sitting room which was very designer, all gold and white. I was I now realise, becoming a little pretentious. No problems with lights, they were all brand new.On they went followed by the tinsel and a whole collection of baubles. The tree as usual was a riot of colour, but there was something niggling away at the back of my mind. Bingo, where were my mums decorations and where were the those made over the years by the kids. With all haste, Nigel was dispatched to the attic to find the missing box, there was none. Of all the things that the shipping company could have lost, I felt the blow of that box most. There was no way to replace any of the items and as it dawned on me that I could never tell my mother what had happened, it also slowly permeated through, that I would not be able to follow on the tradition by handing the baubles down to my own daughter. So the decorating of the tree has now become a bittersweet thing for me. I have added whole Victorian villages, lights galore, inflatables in the garden, you name it we have it. What I no longer have are my mother's items, or the glittery snowflake made by James, the cotton wool snowman Matt made.The salt dough lantern courtesy of Emma. I do I realise as I write this, still have my wonderful memories. We have started our own collection here.We buy a new china ornament with our names and the year, every Xmas and they will eventually be handed down to Emma. So my favourite things may only be memories now, but I am creating future memories for my own children. There is a form of continuity after all.Both Matt and Emma love to do the tree with me and although they will not eat a full mince pie, they do have one bite each to make a wish. I no longer make Xmas pudding, instead my parents send me one, which I open and insert a dime, just as my mum used to put in, sixpence. One day I may even get used to taking a swim after Xmas lunch, instead of a long walk through the countryside.!! I hope most of all, that in the future, my kids will look back and recall how much they loved Xmas and start to make their own traditions as well as continuing the old ones. I love the way you are continuing the British Christmas customs for your children, Fiona. It's important for them to remember where they came from and who they are. I loved reading your post. You write beautifully. The moving company never found that box? That is a real big shame. Have you tried to call them again? I realize a few years have gone by now, but that box may have ended up in some corner and if you call they might be able to locate it now. I always think of England during Christmas. England seems so rich in those holiday traditions. We have ours here too, but the English Christmas customs always seem much more dignified to me. I'm so glad you are keeping those customs alive with your children.